The CDC defines a standard alcoholic drink as being 0.6 ounces of pure alcohol. If we define a standard size of a beer as 12 ounces, then a beer with 5% abv will have exactly 0.6 ounces alcohol. To be defined as a session beer it only makes sense that it should be less alcoholic than a standard drink, so at the very minimum it should be less than 5%. If the light lagers from the macro breweries (Coors Light, Bud Light, Natty Light, …) aren’t sessionable then I don’t know what is, and they consistently have abv values near 4.2%. Based on those two points I would say the upper limit should fall somewhere between 4.2 and 5.0% abv. If you’ve been paying any attention to the craft beer market you know that sessionable IPAs are all the rage these days with relatively new offerings from Founders (All Day IPA, 4.7%), Stone (Go To IPA, 4.5%), Lagunitas (DayTime, 4.6%), Firestone Walker (Easy Jack, 4,5%) and Goose Island (Endless IPA, 5.0%) among others. Today when perusing the beer aisle at the supermarket I came across Fat Head’s entry into the session IPA arena, Sunshine Daydream. I’ve never been disappointed with Fat Head’s hop forward beers so I decided to pick up a six pack and give it a try. What a gorgeous beer, it’s a clear golden colored liquid topped by 3+ fingers of voluptuous snow white head. The head doesn’t go anywhere in a hurry but eventually dies down to a scrim that covers the beer, leaving behind a respectable amount of lacing on the walls of the glass. 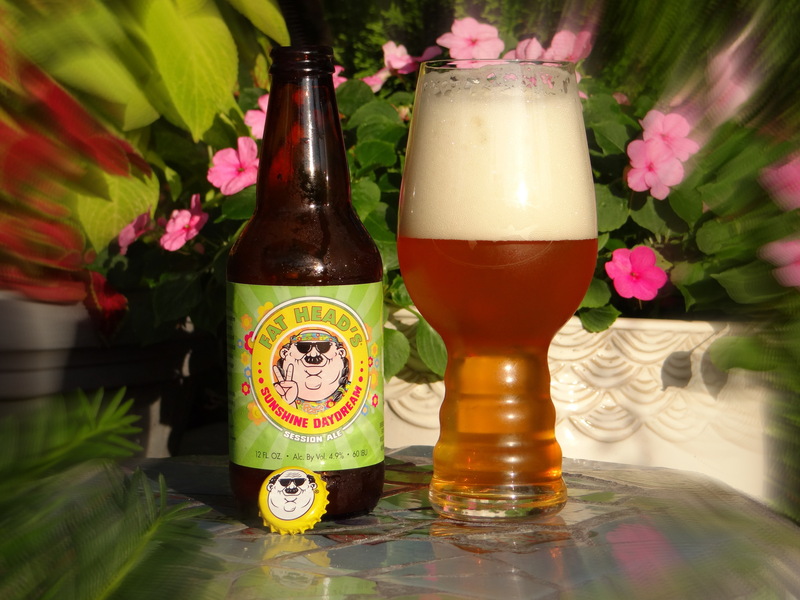 It has a hop-forward nose that tantalizes you with a bevy of citrus fruits. Grapefruit is the easiest to pick out but with a little imagination you can find notes of tangerine and pineapple. With each drink your tongue is greeted by a wave of bright citrusy hops that follows through on the promise of the nose. Flavors of pine emerge near the finish and linger pleasantly after the death of the drink. The pale malts are definitely in the background here but they are substantial enough to keep it tasting like a beer. The bitterness is moderate, typical IPA level stuff. The mouthfeel is light bodied and crisp with a smidge of oily resinous character. This beer goes down easy and leaves you wanting more. Could I drink these all day? Absolutely, but I’m sure the alcohol would catch up to me over time. It is after all the same strength as a Budweiser and in my younger days I tried that experiment more times than I can count and every time I ended up drunk at the end of the night. Session IPA or not this is a really good beer. The malts are dialed back so much in some session IPAs that they taste like water infused with hops. Here Fat Head’s pushes things toward the hop-forward end of the spectrum but stops short of going over that line. I’ve had both Go To IPA and All Day IPA and I think Sunshine Daydream is better than either of those session IPAs. It’s a crisp, refreshing beer spilling over with citrusy hop deliciousness, like sunshine in a bottle. Fat Head’s has delivered the goods once again. Close enough to discuss…who is the Sunshine Daydream paired up with if “Nugget Nectar is Kaley Cuoco, while Chillwave has an edgier, unconventional appeal like Zoey Deschanel”? Good question and I feel like I could go astray if I don’t choose my words carefully, but here goes. Given the use of sunshine in the name it should be a blonde actress. Since it is a session IPA she should be known more for comedy than drama. The restrained malt bill means she should be somewhat slight in build. Off the top of my head maybe Kate Hudson or Elizabeth Banks. What do you think? Maybe best to leave it with an ambiguous ending that could be anything from a compliment to an insult.